Ingrid Ferris grew up in a creative environment in what she refers to as, "The jungles of the Pacific Northwest." Her father was a journalist with an adventurous soul, who would occasionally descend the rickety old stairs of the basement to practice his Highland bagpipes. He also shared with his children a deep love of classical music. Ingrid's mother kept the family intact, she allowed the kids to play pop music on the record player, And as an artist herself, she delighted in the various theatrical antics of her six children, especially of Ingrid and her twin sister who were the family's improvisational entertainers. The heart of the family home was their old player piano. This was where the family would gather on weekends, either to sing along with the old player piano rolls, mainly of old American standards, or to sing along with their friend Matt Olason, a self styled mountain man, who could play just about any instrument you placed in his hands. And it was there, listening intently to Matt playing mandolin, or banjo, guitar, or just pounding away on the piano that Ingrid was first exposed to folk music. One day in fifth grade Ingrid was given the opportunity to leave class to look at musical instruments. Ingrid is not sure whether she was more interested in looking at instruments or getting out of out of class, none-the-less, she looked, and was mesmerized by the beauty of the oboe, by the contrast of silver keys on a black African Rosewood. Ingrid selected this instrument to learn, and there began the hard training that any oboist must endure. The sore lips, the aching jaw, the tedium of making oboe reeds. Hours practicing etudes. Competing in solo competitions. And realizing that the oboe was an excruciatingly challenging instrument, but with one of the most haunting and lyrical tone qualities an orchestral instrument has to offer. After graduating from high school, Ingrid was awarded a scholarship for music and theater to attend the University of Puget Sound. Ingrid completed her first year, but after learning that there was a school in Seattle where she could concentrate solely on her music, she auditioned and was accepted at the Cornish Institute of Allied Arts. There she studied jazz, classical and world music. It was her introduction to jazz that opened up the world of composition for her. The improvisational music that she'd toyed with for fun, and the tunes that came out of her imagination began to take on structure and value. 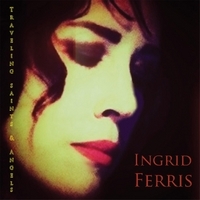 It was also at Cornish that Ingrid first took formal voice instruction. Jay Clayton nurtured her along the winding road of jazz, and Thomasa Echart taught her classical technique. Ingrid remembers Thomasa asking her what was the difference between wailing and singing. The answer of course was, there is no difference. Rounding out her education, Ingrid completed her BA at The Evergreen State College in Olympia where she continued classical vocal training with Joan Winden, as well as majoring in performance art. Ingrid also played principle oboe in the Olympia Chamber Orchestra under the direction of Tim Brock, (Tim later went on to rewrite the film scores for Charlie Chaplain's silent films). At the time that Ingrid worked with Tim, he was already writing film scores for silent movies which the Olympia Chamber Orchestra performed live during silent film festivals. It was around that time that Ingrid fell madly in love with a German exchange student, Oliver, married him and followed him back to Europe. It was there that Ingrid was introduced to traditional Irish and Scottish music, in other words, Celtic music. It was a full immersion experience, singing songs in Germany's Irish pubs until three in the morning, learning those songs first hand from the people who grew up with traditional music practically as a second language, ex-pats from Ireland and Scotland working in Munich. It was there too that she began working with the highly gifted guitarist Arnim Sheffler, forming the group "The Gathering." Homesickness and her mother's terminal illness brought Ingrid, her husband Oliver and their son Kilian back to Olympia where Ingrid quickly rekindled an old music connection with guitarist Giles Arendt. Together they continued exploring Celtic music, eventually adding Diane Sonntag, who Ingrid describes as arriving like Mary Poppins with every instrument imaginable tucked under her arms. Adding Jerilynn Harris on cello the band developed music of many different genres including their own originals. It was a nurturing and supportive group to grow in. But eventually, in that development, the band amicably parted. This transition brought Ingrid into a tumult of self reflection, to decide which direction she wanted to go in with her music. And that leads to a story that she will always remember. Ingrid was celebrating her birthday at Diane's lakefront house. It was a gorgeous, summer day, and Ingrid sat on the deck overlooking the lake playing music to her hearts content, and as she played she began to sing some of her original songs, songs that Diane had never heard before. Diane kept asking for more so Ingrid pulled out her I-pad. There she had 'White Gull' saved in her "Garage Band" program. That may have been the tipping point. Diane understood the potential of this music and was already imagining arrangements. That night a collaboration was born, and you could almost say that the rest is history. Ingrid managed to raise the funds to begin a studio recording via Kickstarter, and after interviewing Bruce Whitcomb, she knew she needn't look any further. Bruce was a technical wizard, an incredibly hard worker, and a wonderful person to be around. And as the project developed, Bruce's talents as a musician became apparent as well. The collaboration between the three of them became a force of creativity, where truly the sum became greater than the parts. Four months in the studio, four songs to debut. And here she is today, Ingrid Ferris, launching her solo career, a career that in truth is peopled by the great musicians and lovers of music from her past. The friends, the family, the teachers. And to all of them, and to the new friends as well, she extends her love and gratitude, and hopes that you will fall in love with her music too!